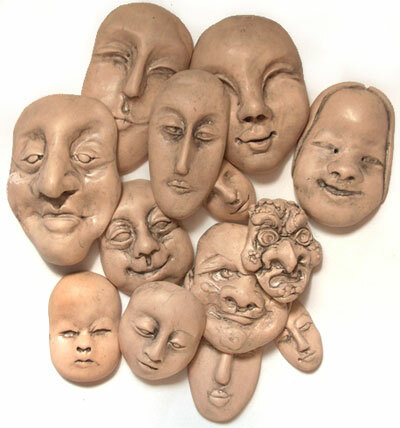 There are commercial molds available for making faces for dolls or jewelry, but those designs were created by someone else, and while you can create items for your own use without violating copyright, and sometimes for sale, the design is still one that is easily recognizable as one that originated elsewhere. While there is nothing wrong with that, I far prefer to use my own sculpted faces, and I encourage others to expand their creative range as well. When you start with your own work, YOU own the copyright, and molds are a great way to easily make copies. 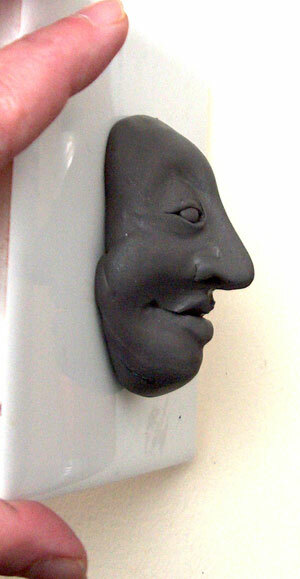 Have you ever wondered how to create and use a mold made from an original hand modeled polymer clay face? There are many ways to do it. Polymer clays, particularly the softer ones like SculpeyIII and Sculpey Bake and Bend, can be used to form hard molds using the polymer clay original. To keep the baked original face from sticking to the softer raw mold clay, a release agent like powder, cornstarch or water mist can be used. The original piece is lightly coated with the release agent and the soft clay is pressed around the original. 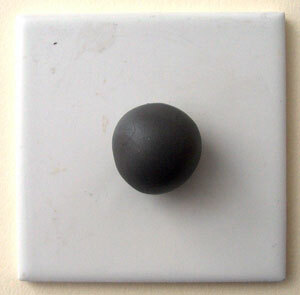 This can be baked in place and removed–IF the piece has been completely covered with the release agent. Kato Polyclay also has a product called Repel-Gel that can be used to keep raw clay pieces from sticking together while curing in the oven. The original piece can also be carefully removed prior to baking, but sometimes this results in the mold being deformed in the process. Molds for use in glass slumping can be made using polymer clay originals with a special plaster mix sold in glass supply sources such as D&L Stained Glass in Boulder CO. 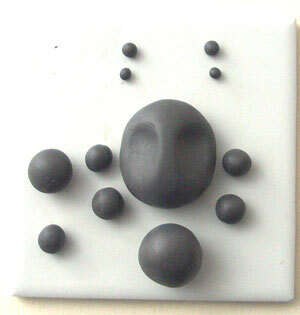 Molds can also be used with ceramic clay. Silicone molds are particularly useful for this, and benefit from a light brushing of a release agent; my preference is a product called Badger Balm that is made for skin care and is olive oil based with beeswax to thicken it. I find it only takes a little bit, and after work is done I use it to moisturize my hands too! My favorite mold making materials are two part silicone compounds, also designated RTV (room temperature vulcanizing) silicones. They do not need a release agent when creating OR when using the mold. They are sturdy and extremely flexible, unlike clay or plaster molds. 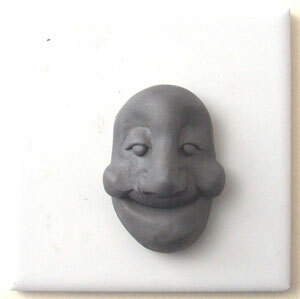 The can be used with items like doll faces that have undercuts, and still release the item or the pulls from the mold. One part of the silicone material set is a white compound and the other is colored. There are many brands on the market, and these are all differentiated by the color– one is hot pink, another brand is blue, and one is purple, and Amazing Mold Putty is yellow. There are also liquid versions for making molds. These are much messier to use than the putty forms, but are better for large projects. They require building a containment box for the liquid rubber, and that’s a whole other tutorial! One of the nice parts about using mold putty is not needing a containment box or dam. Amazing Mold Putty can be heated to 395 degrees F and is also rated at Food Grade, which means you can use it to make molds for gelatin, chocolates or other candies and it can also be baked as with cakes or cookie doughs. For more information about the kinds of RTV silicones and their uses, click here. 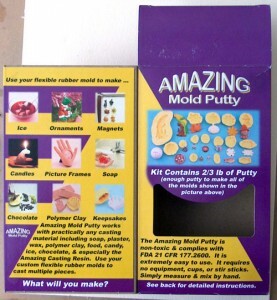 Amazing Mold Putty comes in a box as shown at right and the kit contains 2/3 pound total of the two parts. It also comes in 3lb. bulk units. It is easier to model a face with “character” than to create a sweet little baby or fashion model. Starting with larger facial features gives you a chance to practice, and then you can refine your technique later. Starting large gives you more design options, and a chance to practice sculpting skills. 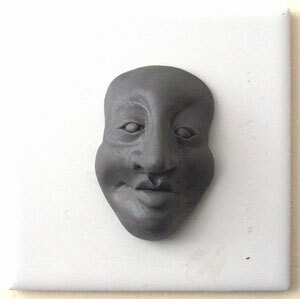 An important point to remember when making molds is that a more generic face can be the starting point for many different “looks”. A large nose or prominent lips can be easily reshaped on an individual pull from the mold. Raw clay excesses can be more easily removed than added. 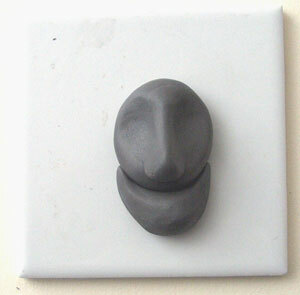 The face modeled here on this page has a large nose and strong jaw, and can be used as a male or female face, depending on how the pull from the mold is detailed, painted and dressed. Simple tools include an X-acto knife and a rubber tipped shaping tool to make modeling small faces easier. Toothpicks, Q-tips and knitting needles can also be used for smoothing and shaping areas where its hard to get your fingertips. The shaping tool is double tipped, with a point on one end and a chisel on the other. With tips made of silicone rubber, these tools come in several sizes and shapes and are very useful. You can also use silicone rubber molding materials to make your own shaped tools if you like! A ceramic tile makes a good work surface. It can be popped right into the oven when your piece is ready to bake.These tiles are plain white tiles found at hardware stores. Small, portable and inexpensive–my favorite kind of supplies and tools! 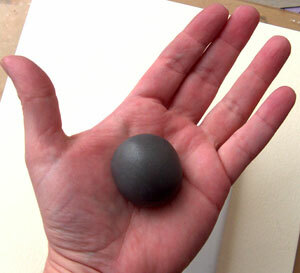 This 2 1/2 inch face starts with a ball of clay about the size of a walnut. Use any solid color, even a mud or “schmutz” mix of all the remnants from other projects–but DO make sure it is blended to a solid color with no stripes or swirls. Those color variations make it much more difficult to really see what you are doing. Your brain and eyes get fooled by any pattern in the clay itself–so go for a solid color. Roll the clay into a smooth solid ball. 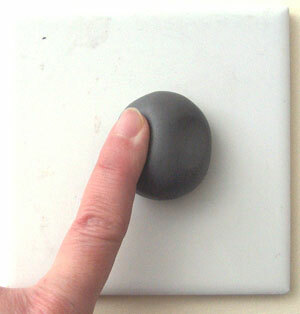 Place the ball of clay onto the tile work surface and press slightly to flatten the back. This ball will form the top of the head, and the bottom jaw will be added. Use a finger or thumb to make eye socket depressions. Place them slightly above the center line in the ball, and leave room for the forehead above and the lower jaw below. Leave a bit of room in between for the nose. Faces are mostly bilaterally symmetric–the same on two sides.While we all have some variances, symmetry is a good target to aim towards as a sculptor. 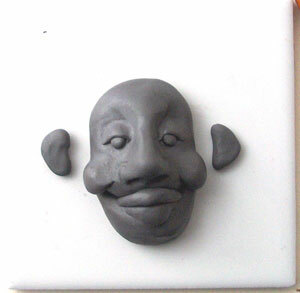 To make it easier to be equal, portion the amounts of clay for the various parts before forming, shaping or placing them on the face. Shown at left–above the head are two sets of balls for eyelids and eyes.To the far left of the head is a large ball for the nose and a smaller one below for the lips. 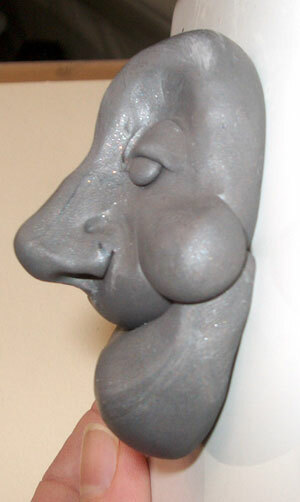 To the left and right of the face are small balls for ears (these are optional–best for adding to finished pieces but not for mold originals) and below that are slightly larger balls for the cheeks. Below the head is the clay for the lower jaw.The clay amounts shown here give you a guideline, but you can use more or less to create larger or smaller features. The nose mass has been smoothed down on each side to join it to the main bulk of the face. It is also smoothed up and to the sides of the brow to create a forehead with two defined eye sockets to either side. If the nose is larger than you like, now is a good time to remove excess.The jaw is placed below the main head portion and forms the bottom part of the head. Attach it at either side but do not meld the upper and lower mouth area in front. 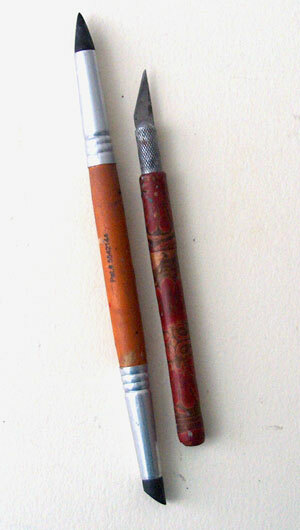 The rubber tip tool is used to form two nostrils with a space in between for the septum. 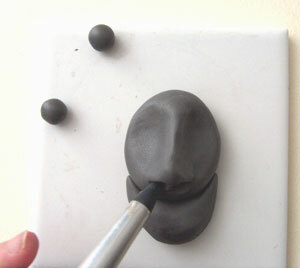 Push the point of the tip into the clay and pull gently towards the outside of the face, repeat on the other side. Hold the length of the nose carefully between a finger and thumb leaving the ball of the nose and nostrils exposed to help hold it in place while doing final shaping of the nose. 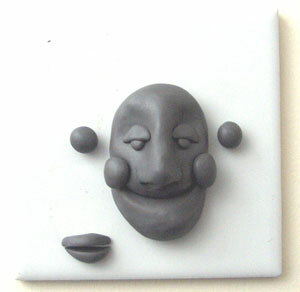 Place the eye balls into the sockets on either side of the nose. Press into place enough that they don’t roll off, but do not flatten.Place the cheek masses to either side of the nose but not touching the nose, making sure that they are below the eyeballs and near where the jaws merge. Eyelids are circles flattened and cut in half moon shapes.Notice that the face is roughly in thirds as far as mass goes, with the eyes, nose, mouth and cheeks filling the center third or more. A common error in sculpting heads is to not leave enough mass for the upper skull and lower jaw, resulting in a face that is mostly eyes, nose and lips. Place the moon shaped eyelid pieces over the top of the eyeball. Press gently into place ONLY at the top curve of the crescent, do not flatten the ball of the eye or the bottom of the eyelid. The ear pieces are shown here for size reference, but I find it is best to add ears to each final cast piece rather than try to make them part of the original and mold. 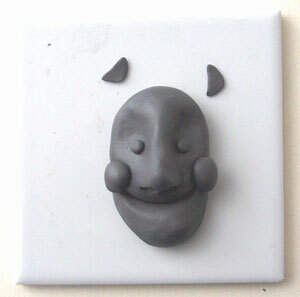 Its a part that often tears or deforms when removing the pull from the mold or refining it. The lip mass is flattened slightly into an oval shape and then cut across the length with the X-acto knife to form two lips. Use the rubber tip tool to smooth the seams of the tops of the eyelids and the tops and sides of the cheeks. As shown at left, the cheek masses are left overhanging the face to create “apple cheeks”. Use the side of the tip for smoothing, and the tip for delineating the curve of the nostril. The face could be left as it is now if desired.A cartoon-like look is attained by using simple masses not burdened with a lot of detail. However, the lack of bulk in the mouth area makes the face seem sunken and toothless–which is fine for some older character faces. The eyes also lack a lower lid, which gives it more of a caricature look that is less realistic. Again, this may be appropriate for the character you are creating, or you may wish to continue with more detail and refining. 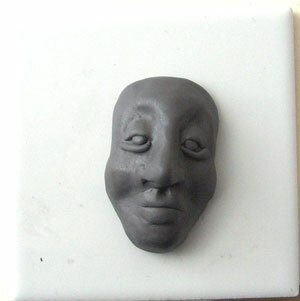 Before making the any final decisions and baking the face, look at the face from both sides as well as straight-on. Check to make sure there is a bridge to the nose and that it does not join the forehead in a line that continues straight back into the head. Do any adjustments needed to make sure the eyes are not too close or too far apart. You can also use a mirror to look at the piece. When working with concentration for any length of time, your eyes stop seeing everything in fresh detail–using a mirror gives your brain a new perspective and any flaws that were overlooked will be quickly apparent. Place the lips into the mouth depression.Make certain to leave a little bit of space under the nose. Use the rubber tipped shaper to smooth the top of the top lip into the mouth, and the bottom of the bottom lip. The optional ears are shown here to indicate shape and placement. However, I did not add them to the face after all. Very small snakes of clay are curved and placed under the eyeballs. They touch the bottom of the eyeball and the two ends of the top eyelid.They do not cover the lower portion of the eyeball, but they don’t leave any open space there underneath either. 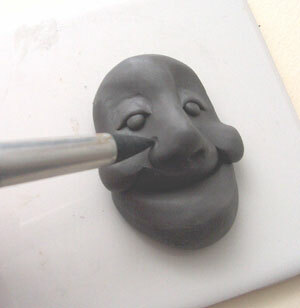 The lips are smoothed into the face using the rubber tipped shaper again. The lips start out larger than you may think necessary in order to have enough bulk to smooth some into the surrounding cheek and chin areas. Otherwise you can end up with very thin lips. The point of the shaper tool is used to create the small cupped impressed area directly underneath the nose, called the “naral”. This indentation does not split the upper lip itself.Use the shaper tool to smooth the bottom portion of the bottom eyelid into place. The shaper works best for smoothing when using the side of the point to draw along a seam, or rolled instead of drawn.Practice smoothing on two other pieces of clay until you find what works best for you and your kind of clay. Check the sides of the piece again, making sure that the mouth and jaw are not too far in or out, and that the chin and jaw line join the nose and brow to create a pleasing profile. Use the point of the shaping tool to gently pull the mouth line from the center to each side to create an expression as desired. Remember though that a neutral expression on the original piece can be used to make pulls that can then be altered to the expression as you wish. This gives you many more options later on. The point of the tool can be used in the corners of the mouth and also to create dimples.Also use it to slightly pull down the inner corner of each eye, making a tear duct. Before you bake the sculpted piece, walk away for a while–a few hours or even overnight. Check the piece again and you may well find small areas that you wish to change–big flaws are often obvious right away, and the smaller ones need a bit of later review to find. Bake the piece according to the package directions given by the manufacturer of your particular brand of clay. In general, this usually requires curing the clay in an oven set at 275 degrees F for 45 minutes to an hour, but directions do vary by brand. Originals can be sanded, carved, added to and re-baked if needed to correct or change anything before creating the mold. Allow to cool completely before making a mold.